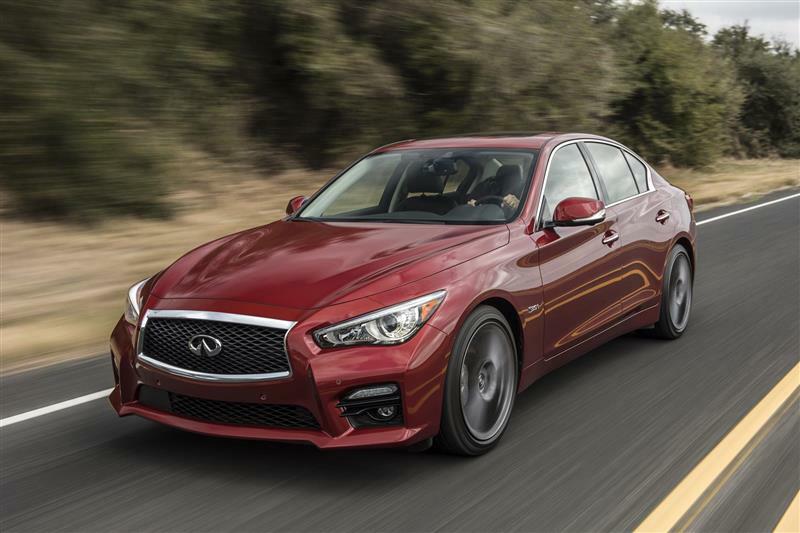 • Q50 performance flagship Red Sport 400, with 400-horsepower 3.0-liter V6 twin-turbo engine, is priced from under $50,000 for both rear-wheel and all-wheel drive modelsFRANKLIN, Tenn. – Infiniti today announced pricing for the 2016 Infiniti Q50 Red Sport 400 of $47,950 for the rear-wheel drive and $49,950 for the all-wheel drive configurations. The new performance flagship of the Q50 portfolio is on sale now at Infiniti retailers nationwide. 'The Q50 Red Sport 400 carves out a unique space in the sports sedan segment – with no other rival offering this much horsepower priced under $50,000,' said Randy Parker, vice president, Infiniti Americas. The new VR-series engine family replaces the award-winning Infiniti 3.7-liter VQ-series V6 in the Q50, which has been the industry standard for many years. Key engine features for the Red Sport 400 version include a compact, lightweight aluminum-alloy engine block and cylinder heads, Gasoline Direct Injection system, optimized turbine blade design, an optical turbo speed sensor, high capacity air-to-water intercooler system with dual water pumps, electronic wastegate actuator, e-motor valve timing control and an integrated exhaust manifold. The 2016 Infiniti Q50 is also available with three other powertrains – a new 2.0-liter I4 Turbo, a 3.5-liter V6 hybrid and an upcoming 300-horsepower 3.0-liter V6 twin turbo. The Q50 2.0t and Q50 Hybrid Premium models are on sale now with pricing starting at $33,950 for the Q50 2.0t and $47,050 for the Q50 Hybrid Premium. Pricing for the 3.0-liter V6 twin-turbo equipped 3.0t will be announced at a later date. Infiniti Motor Company Ltd. is headquartered in Hong Kong with sales operations in over 50 countries. The Infiniti brand was launched in 1989. Its range of premium automobiles is currently built in manufacturing facilities in Japan, the Únited States, Únited Kingdom and China. Infiniti plans to also expand manufacturing into Mexico by 2017. Infiniti design studios are located in Atsugi-Shi near Yokohama, London, San Diego and Beijing.